This morning I woke up with a resolution not to listen to every discomfort in my mind or body, but instead to enjoy the walk, enjoy my days, be very humble and unimportant, kind, innocent and pure in my thinking, and to bless the world with every step I take. In front of our bedroom window, surfers in wetsuits were already catching the morning waves. This entire coastline has many, many surfers’ beaches, with beautiful waves and smooth sands. 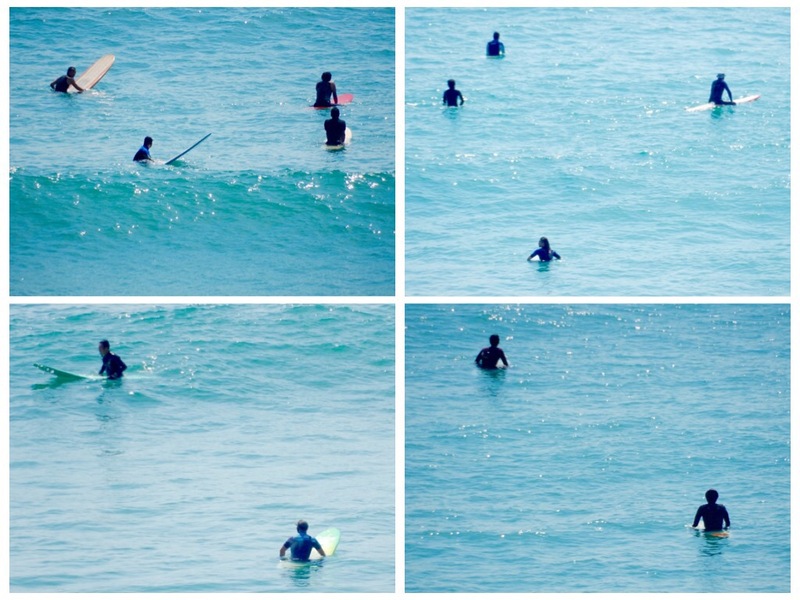 It looked like SO MUCH fun, that I craved to be there with them in my wetsuit, waiting for hours for a few good waves…. Not to be talking to anyone, not busy thinking, just letting the waves lull me into the quiet Universe within…. Nothing important to do but to catch a few waves here and there. Then I reminded myself that to everything there is a place and a time. Today, this week, this month, and the next month, I am walking a pilgrimage. There will be time to lay on the beach and time to dive, time to swim and time to surf. Now is the time for our pilgrimage. We ate breakfast like we were two hungry surfers who had spent the day on the waves without any drink or food. We ate grilled Salmon and chips, a miso soup, steamed rice with pickles, a green salad, seaweed salad, potato salad, unsweetened yogurt with granola, fresh fruit and green tea. We meditated in front of the ocean and the breeze revived my spirit. We strapped on our backpacks, paid our hotel bill and started walking south along the water. Jules wanted to get his hair cut and as we passed by a beauty salon, the friendly hairdresser wearing platform shoes, short shorts and long black stockings, opened the door to her shop and invited us in. She gave me hot green tea and cookies while she cut Jules’ hair. What a difference between this kind hairdresser and the money oriented hair cutters back home. Jules got a lovely bandana with dragons painted on it and I got a gift of a pair of frilly pink socks and two packages of tissues. I was happy with the socks, because every night after rubbing my feet with facial cream mixed with essential oils, I have been thinking to myself that I should have simple socks to keep the cream on my feet and not to stain the clean sheets. I prefer not to use my hiking socks, and every day I forget to buy a pair of cotton socks in a convenience store. In the parking lot near the hotel, there are large public showers and toilets for the surfers who come to camp or surf on the beach. Many had the backs of their minivans open, and they hang their wetsuits to dry from the doors. One enterprising woman parked her car in the middle of the parking lot. She had a folding table and a small grill and she was selling home made burgers with grilled avocado and tomatoes to the surfers. She sat in her car when no one was around. There was also a large shop selling farm vegetables, homemade products, and very fresh seafood from the local fishermen, along with a small restaurant that sold hot food. We chose a table overlooking the beach and had a meal of local Shikoku specialities. One of the famous foods in the area is called Chikuwa, which is a Surimi fish cake wrapped around a bamboo stick which is later grilled. We also had a seafood tempura cake and an orange and vanilla ice cream. It felt luxurious to sit by the ocean and take the time to enjoy lunch. Because our walk today was short, we decided to walk more in order to cut off a few kilometers from tomorrow’s longer walk. Even though all we walked today was 13 kilometers, my feet still felt tired. I guess it will take awhile to get used to walking every day. On an empty beach, I took off my shoes and soaked my feet in the salt water. The water felt cool and nice, but walking on the rocky shore felt too tough on my blistered feet. Our hotel offers only breakfast, so we checked what was available in Toyo town, but there are only three places to eat dinner, and almost no choices for vegetarians who are willing to eat some fish. Instead of dining out, we bought large bento boxes at the farm shop upon our return from our walk and ate them in our room. They were “Oishkatta desu” (past tense of “delicious”). Tomorrow we continue south along the coast – it will take another day before we will reach Temple 24 “Asate” (the day after tomorrow). But not the man who seeks it. But not the traveller who walks on it…..